The $25 million project calls for new canopies, a reconfigured bus terminal, repainted walls and more benches. 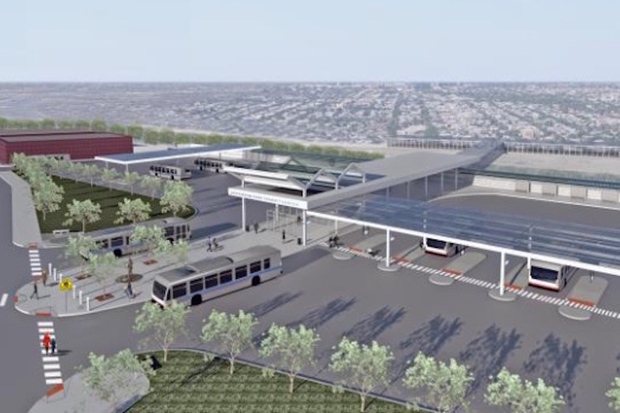 CHICAGO — City officials Wednesday announced the construction company they've chosen to give the Jefferson Park Transit Center a $25 million facelift, setting the stage for work to begin next year. Walsh Construction Company II will build "newly redesigned canopies" over the train platform and "improved reconfiguration of the bus bays to accommodate those with disabilities," according to the announcement. Crews will also repaint the station walls, install LED lights and add more benches and trash cans, officials said. With nearly 20,000 daily commuters, the transit center is the city's second-busiest station outside Downtown. First teased in 2015, the renovation will mark the final piece of the CTA's Your New Blue plan, which has brought track and station upgrades all along the north branch of the Blue Line since 2014. The renovation of the Jefferson Park station is projected to be completed in 2019, officials said.